Thanksgiving is Over; Bring on Christmas! You are here: Home / Parenting Blog at KidsAintCheap / Holidays / Thanksgiving is Over; Bring on Christmas! What a great time of year. Despite the fact that I hate the cold and in turn, hate most of the Winter, I really love November and December. They are the two most family focused months of the year and where our family’s traditions really come to life. Thanksgiving and Christmas are without a doubt, my two favorite holidays. 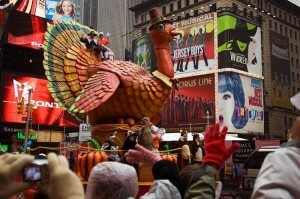 I had a fantastic Thanksgiving with my family and am preparing for a month of Christmas celebration. We started decorating this past weekend and we are going to finish it up this coming weekend. Shopping has started and we have begun to rotate Christmas movies and shows into our rotation. I am excited for a fun month and we hope to bring you tips, reviews and posts centered around the holiday spirit over the next couple of weeks so if you haven’t already done so, please subscribe to our feed and follow along with us. It’s funny because the reality is, everything possible is fighting against my enjoyment of this holiday season. I am an owner and main operations manager in a popular niche Ecommerce web site. We do an INSANE amount of business in the last week of November through the month of December. That means a lot of prep work before hand, and a lot of long hours during the season . I really have to make an effort to find the time and energy to actually enjoy myself. Additionally, as I have previously mentioned, my last business was a miserable failure and got me and my family into really poor financial shape. We are climbing out of it but it’s always stressful trying to find the money to enjoy the holidays and find creative ways to give gifts without breaking the bank. But in the end,, if I let either of these two things ruin my favorite holidays, holidays that are focused on family, then I lose a lot more than just the enjoyment of the season. What is the point of any of it if you can’t enjoy family time? Are you ready for the Christmas season yet? How was your Thanksgiving?